As you probably know, gang activity among our Latino youth is a prevalent and concerning issue at various schools in our district. According to Mr. Tony Majors (Glencliff High School Principal), parents would particularly like to hear how their sons and daughters are becoming involved in gangs and what they go through to be initiated. Many Latino parents have expressed a desire to learn more about the warning signs of gang activity and how they can help. Because of this, a planning committee comprised of both local Latino leaders and Glencliff HS & the district has been meeting for several weeks to share different ideas to organize a gang-awareness event for our Latino families. We have selected this coming Saturday, January 9th, 2010, from 10:00 a.m. to 2:00 p.m., for this conference. It will take place in the auditorium of Glencliff High School, 160 Antioch Pike, Nashville, 37211. 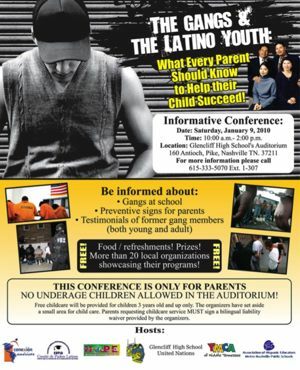 While no parent will be turned away, the emphasis will be for Latino parents of middle and high school children in the Glencliff, Antioch, Cane Ridge, Overton, and McGavock clusters. This event is FREE of charge. Representatives from the MNPD El Protector and the Gang Unit. In addition to a great conference, various sponsors will provide FREE food, indoor entertainment for kids over 3 years old (a “Kids Zone”, in lieu of “childcare,” as stated on the flyer), and drawings (a laptop computer is included among the prizes, thanks to a community contributor!!!). We are looking forward to having a candid conversation with parents and community leaders on this issue, hoping that it can eventually be gradually curbed or eradicated altogether. We hope you can join us and/or help us spread the word for this event.